The Hook of Holland Boat Express. IT would be interesting to know the exact derivation of the injunction to “hook it”, which in the course of time has doubtless been hurled at most of us - and probably not without good reason! If you want to “hook it” in the very best style, the London and North Eastern Railway, so their posters tell you, can provide you with a train for the purpose. You may, in fact, “hook it” by the “Hook train”, as the subject of our consideration this month is generally known, tout court, to the railway staff who are concerned with its working. It conveys passengers from Liverpool Street Station in London to Parkeston Quay at Harwich, on the Essex coast, where they join a swift turbine steamer to take them to Hook of Holland, the Dutch seaport on the northern side of the delta of the great Rhine. From Hook of Holland Continental trains hurry away to Rotterdam, Holland, Germany and beyond. Our train furnishes a decided contrast to those with which we have already dealt in this series. Instead of a journey of 400, 300, 200, or even 100 miles, the “Hook of Holland Boat Express” is content with one of 69 miles only, although, to be sure, it makes the trip twice daily, up in the early morning and down at night. No tremendously high speeds are possible during the run, because of the serious obstacles to speed, which we shall note in a moment. We are unlikely to “clock” any higher maximum rate than 70 miles an hour, or slightly over, save on the up journey, where we may reach 75 or so at the foot of Brentwood Bank. Neither can the London and North Eastern Railway authorities use any of their biggest and most powerful locomotives on this service, as the clearance of certain overline bridges makes it necessary to keep the maximum height of the engines down to a shade tinder 13 ft, and the comparative weakness of certain bridges under the line has made it necessary to restrict the maximum weight of engines over this route to a figure considerably below that obtaining on other parts of the system. So our Great Eastern 4-6-0 engine, at the head of the train, has a weight, without tender, of only 64 tons, as against, say, the 921 tons of a Gresley “Pacific”. And why all these difficulties? The old Great Eastern Railway was an amalgamation of a number of lines constructed through country that could never offer much in the way of remunerative traffic, save for a couple of months or so in the summer, when holiday-makers are hurrying to the East Coast. Consequently not so much was done as on our other great trunk lines in the way of heavy earthworks or engineering works, with the result that, in the nominal flatness of the Eastern Counties, the Great Eastern has some very heavy gradients. In order that you may understand how this fact affects the working of the “Hook of Holland Boat Express”, I have prepared a profile of the “banks” between Liverpool Street and Parkeston Quay, which is here reproduced. You will see that there is not a level stretch anywhere on the journey. Not only that, but on account of sharp curves through various big towns and junctions severe reductions of speed are necessary at the five different points that I have indicated; at three of them the speed would normally rule at a high figure, as they are at the bottom of inclines from both directions of running. In this manner, too, insult is added to injury, as the unfortunate locomotive has to try and recover her lost momentum on an ascending gradient. To maintain an average speed of 50.3 miles per hour over the 69 miles between Liverpool Street and Harwich is therefore a really marvellous feat for a 64-ton locomotive hauling a train which, inclusive of her own tender, may weigh anything up to 470 tons, or occasionally even 500 tons. It is, indeed, a job for expert drivers and firemen only. The small “link” of engine crews engaged in working the night boat expresses - the Hook of Holland and Antwerp trains down and the two corresponding trains up each day - numbers only four all told, each of which gets one Continental working a day. The drivers and firemen are all attached to the locomotive shed at Parkeston Quay. It should be added that the up morning Continental trains have rather easier timings than those in the down direction, while even the down Antwerp train, which runs ten minutes behind the “Hook of Holland Express”, although it maintains the same start-to-stop time of 82 minutes to Parkeston, is not quite such a hard duty, as it carries a lighter formation than its predecessor. At normal times the “Hook of Holland Express” is, by a wide margin, the stiffest locomotive duty over any part of the old Great Eastern system. Arriving at Liverpool Street Terminus shortly after eight o’clock in the evening we shall find a scene of considerable activity at No. 9 platform, where is drawn up the luxurious set of coaches in which we are to be whirled to Parkeston Quay. No. 9 is the longest platform at Liverpool Street, measuring 900 ft from end to end, which is just as well, as no other of the Liverpool Street departure platforms could accommodate the full length of our train. There are at Liverpool Street in all some 18 platforms, 10 of which belong to the original terminus, opened in 1874, and the remaining eight to the “East Side”, which was added in 1894. For the enormous traffic that it handles daily, Liverpool Street is a remarkably compact terminus; despite its 18 platforms, it covers no more than 16 acres. No less than 1,200 trains are worked in and out of Liverpool Street in every 24 hours, the station having to deal with roughly one-quarter-of-a-million passengers daily. Not even the bigger Waterloo can equal such figures as these, which are a record for a British terminus. To see the stream of business passengers pouring into Liverpool Street in the mornings is one of the sights of London. By the time of our arrival in the evening the outward-bound stream has dwindled, by comparison, to a mere trickle. An evidence of its extent, when in full flood, is afforded by the fact that 24 steam trains per hour, with a total seating capacity of 20,000, pass out on the down Suburban line alone (apart from the trains over the down “Local” and down “Through” lines) during the “rush” hours. This is what has been called the “Intensive” train service to Walthamstow, Chingford, Enfield and Palace Gates, and represents by far the densest service of steam trains ever put upon metals in any country. The old Great Eastern always specialised in rapid passenger handling, and was the first railway to introduce suburban coaches seating six passengers a-side. Later on, by a surgical operation of considerable interest, the older five-a-side suburban coaches were cut in halves lengthways, and a strip of new coach was inserted down the centre of each, to bring them up to the new width and seating capacity. But we are straying from the “Hook of Holland Express”, whose starting time is rapidly approaching. At the back end of the train are a couple of capacious brake-vans; their loading is now nearly complete. Next in order come two beautiful Pullman cars, with their inviting interiors; their inclusion in the train, however, means another 88 tons of “tare” for the locomotive, and all for the seating of, at most, 40 fortunate first-class passengers. Pullman car accommodation therefore means rather over two tons of coach weight to every passenger conveyed. The main passenger part of the train now begins, and its similarity in appearance to the “Flying Scotsman” may make us rub our eyes at first, and wonder whether we have not come to King’s Cross by mistake! But this is the new standard for LNER main line stock, with the rounded coach-ends and curved roof-ends that give such a handsome and distinctive appearance to a London and North Eastern express. You will notice, too, the automatic central couplers, instead of side buffers and screw couplings. These couplers, which are used universally in America and have been standard on the East Coast Route since 1897, add greatly to the steadiness of the train when running, and are a valuable safeguard against telescoping in the unlikely event of a derailment. class corridor coaches, and a second-class brake coach in front. With the two Pullmans and the two rear brakes, we therefore have 12 vehicles, all 8-wheelers except the Pullmans, which are 12-wheelers. This makes a total empty coach weight behind the engine tender of just over 400 tons, and with a normal complement of passengers and luggage the driver may expect to have some 430 tons in all to haul, or 470 tons with his tender. 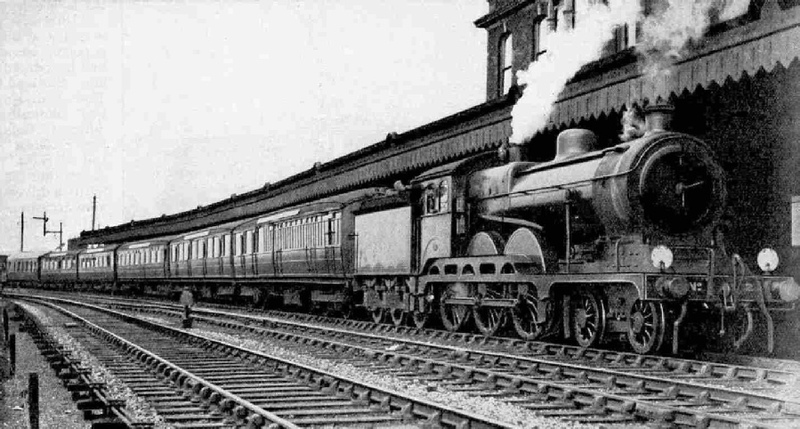 “Hooking it” by LNER: The “Hook of Holland Express” at full speed, passing Chadwell Heath. And now here we are at the engine. It looks quite deceptively large, but if you study the side elevation carefully, you will see that this is chiefly due to the exceptional size of the driver’s cab, which is, without question, the most capacious and comfortable express locomotive cab in the country. The old Great Eastern Railway, from the introduction of the 4-4-0 engine “Claud Hamilton” in 1900, has always taken a lead in looking after the comfort of its locomotive crews. This fine cab, with its big side-windows and roof extending well back over the front of the tender, is an object-lesson in what can be done; its only possible objection is the distance that the fireman has to traverse his coal from the tender across to the fire-hole door. But as regards the engine itself, the boiler-barrel is only 5 ft 1-in in diameter and 12 ft 6-in in length, winch are comp-aratively small dimensions for a present-day 4-6-0 locomotive. These engines probably owe their successful steaming to a firebox of generous dimensions; it is of the Belpaire type, with a firegrate affording 26½ sq ft of area. On a journey of this kind it is impossible to scrutinise coal consumption too narrowly. Quite possibly the engine may bum 60 lb of coal a mile on the way down and she will almost certainly be “thrashed” in some degree in order to keep time. But the run is soon over, and a little thrashing on this short run is cheaper than the provision of a “pilot”, or assisting engine, for which I am sure that those enthusiastic engine-crews at Parkeston would scorn to ask, no matter what was the load behind them. The big suspended clock in the middle of Liverpool Street Station is now on the stroke of 8.30, and we must hurriedly get in. We will ensconce ourselves in the front coach, as the voice of our steed in “full cry” is one of the thrills of this journey that must not be missed. Steam is already blowing-off hard from the safety-valves when the signal is given to start, as one of the hardest pulls we have to encounter begins but a brief three-quarters-of-a-mile out of the terminus. Regulator wide open and 50 per cent, cut-off or more will be the order of the day, at least until we have surmounted the ½-mile at 1 in 70 up to Bethnal Green Junction, and the vocal efforts of the locomotive will be proportionately loud. From Bethnal Green the gradients are slightly in the engine’s favour as far as Stratford, but the drastic speed reduction over the curve through the platform loses us much of the momentum we have gained by attaining 50 an hour or so as we swung round Bryant and May’s great match factory at Bow on to the straight. The mile from here to Stratford is one of the busiest on the system; it has six, and for part of the distance eight parallel lines, spanned by a whole succession of complicated signal gantries, and if we get through without a signal check we shall be lucky. The section between Bow Junction and Stratford is, indeed, one of the worst obstacles to the electrification of the Great Eastern suburban lines of the LNER. All the trains from the Fenchurch Street direction, getting across to the slow lines, have to cross the main lines “on the flat”, and to get any value out of electrification by the provision of more frequent train services would certainly entail the provision of “flying” junctions here, at a cost which alone would run into millions sterling of money. Such facts as this are often forgotten by those who imagine that electrification is a comparatively simple matter. 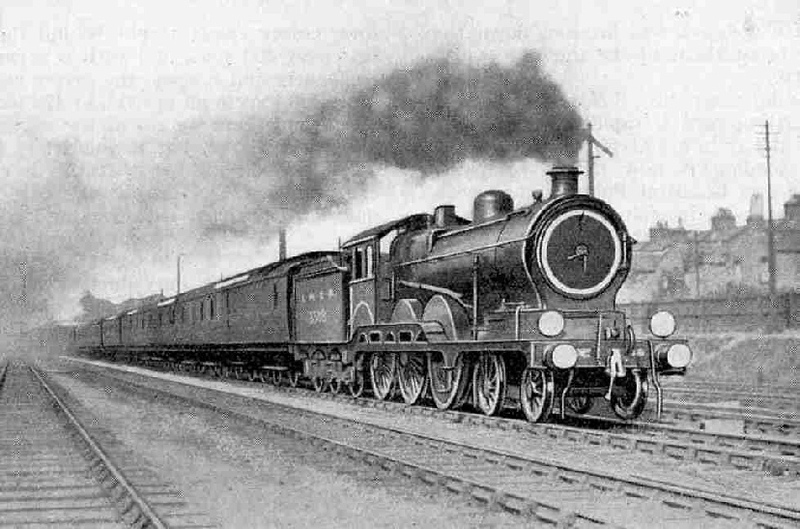 LNER “1500” Class 4-6-0 engine used for hauling the “Hook of Holland” boat train. wide over the countryside - but quite possibly we may be a minute or so “down” through Shenfield. This is one of the fortunate nights, and when at last we have threaded our way up to the deep cutting past Brentwood, with regulator fully open and very likely quite 60 per cent, cut-off, under the handsome “Seven-Arch Bridge” to the signal box at Ingrave, which marks the summit of our practically unbroken climb from Stratford, we have just the 1¼ minutes left in which to breast Shenfield at the scheduled time of 8.58 p.m.
At last our driver breathes more freely; once past Shenfield Junction we are well out of the London suburban area, and may expect a clear road now for the rest of the way. The fireman, whose efforts have been unceasing up to this point, probably snatches a moment’s rest. But their is little rest for the engine; cut-off has now been brought back to 30 per cent, or so, and the regulator has been moved to about half-open, but this is still “going some”. We are accelerating rapidly, and on the 9½ miles from Shenfield to the county town of Chelmsford, only allowed 10 minutes, we shall very likely just cross the “seventy” line before we slow down for Chelmsford curve. Away we go again, noting on the left of us - if it is still light - the two great wireless masts of the Marconi Company’s works, from which the earliest British high-power broadcasts were sent out, before the erection of the present Daventry station. The rising grade up which we have to recover speed is fortunately but short, as for the next 22 miles to Colchester the time-table only concedes 23 minutes to our hard-worked steed, and the actual time taken is not infrequently less than 22 minutes if the train has been late past Shenfield. The short down-grade to Witham Junction gives a slight fillip to the speed, bringing us up to 66 or 67 an hour, and the rise from Kelvedon through the Essex fruit orchards up to Hill House signal-box means a drop in speed again to between 50 and 55 m.p.h. Thence we hurry over sharp undulations until we get on to the steepish descent to Colchester, which may produce another “seventy” as we fly over Lexden Viaduct, with the town of Colchester crowning the high ground on our right. On go the brakes again, for Colchester Station is sharply curved; and now we have to recover up a nasty little rise to Parson’s Heath signal-box. Then, once through Ardleigh, comes the steepest descent of the whole journey, down to Manningtree. Were we continuing along the main line to Ipswich, the driver might forget his troubles and “let her go”; but we shall not have risen much above 60 miles an hour when the brakes go grinding on hard again, as we have now to slacken very severely to 20 miles an hour, in order to take the curve on to the Harwich branch. Yet once again the engine has a steep incline up which to recover speed, and mostly rising grades on to Wrabness; indeed, this last stretch of 9½ miles, only allowed 12 minutes from a 20-miles-an-hour slack to the dead stop at Parkeston Quay, is perhaps the most difficult stage of the whole journey. If half-a-minute, or possibly a minute, has been “snatched” off the booking of 42 minutes for 39¼ miles from Shenfield to Manningtree - little enough, in all conscience, with the Chelmsford and Colchester slacks - it will prove more than useful now. Once past Wrabness, all the difficulties of the journey are at an end. The fireman is now beginning to rake out the fire that he has been maintaining with such strenuous efforts throughout the journey, in order that there may not be too much when the engine reaches the shed for the night. It is growing dusk, and all the myriad lights of Parkeston Quay bear into view as we swing round the wide curve - doing just about a mile-a-minute - leading to the Quay Station. Brakes go on again, but for the last time, and punctually to the minute, at 9.52 p.m. we draw up at the long platform. No time is to be wasted here, as the Antwerp train is due in 10 minutes behind us, and before that our passengers must be off the platform. A shunting engine has whisked off the two vans at the rear and taken them round on to the Quay itself, opposite the Hook of Holland steamer, and our engine and train have moved off to the carriage sidings. There is just time to hurry up to the engine and give our warmest congratulations to driver and fireman. We could tour the country without noting anywhere a finer feat of locomotive handling than we have witnessed to-night, and as we see our foreign visitors step on board, we realise that our engine crew have at least done their best, in a very literal way, to “speed the parting guest”. The “Hook of Holland Express” on Brentwood Bank. You can read more on “The Flying Scotsman”, “The North Country Continental” and “The Silver Jubilee” on this website.